So if you read my post about what I learnt from Uni you may be wondering what will I do now? (Or maybe it is just me pondering this question). After spending my life at school and then at Uni with no break in between study feels like my life, what I know, what I am comfortable with. So naturally I planned to carry on with it. Unfortunately the program I wanted to carry on with was a 4 year honors/PhD combined program in clinical psychology which took only 11 students per year and the key quality for them in choosing was Life Experience. I can quantify my grades, I can record every job of every year and every ounce of work experience. But life experience? Despite my 21 years I feel I do have more life experience than some but I completely understand their reservations in training up someone who has never worked full time, hasn’t been married, has no kids and so on. How can I help others cope with the issues they face when I still have a lot of room to grow and mature? So I applied and in case you hadn’t gathered I didn’t get through. Was I surprised? Not at all. Was I disappointed? Utterly devastated. This is my dream and to be able to get in would have meant the next 4 years being planned and ready. Instead I was left feeling like I had failed (and I take failure a little too seriously some may say). Skip forward a couple days of tears and self-doubt/shame and I was feeling a bit different. I still feel embarrassed to tell people, even though it would have been a very slim chance of getting in I can’t help but feel that sense of not being good enough (which I wasn’t) and having to admit to people that I failed to prove myself this time around makes my heart hurt. On the flip-side of this rather depressing coin was the positive thinking (which was helped by my amazing mum and fiancee who told me I was silly for feeling like a failure and reminded me of the facts). After 4 years of study I am tired. Mentally, Emotionally and Physically tired. So although clinical psych is what I want to do, going straight into another 4 years of study that would be a lot harder was daunting. To be honest I wasn’t sure I could take it. I needed a break and a change from the study that had consumed my life. So God shut this door for now and to be honest I don’t blame him. Maybe I am not ready right now for this 4 year program and maybe in a couple years time I will be in a better place to cope with what the course throws at me. Okay whew that was a rambly explanation of what I’m not doing haha. Now onto where I am going in the next couple of years. First up I want to do a 3 week CELTA (English language teaching qualification) which is held in January and is a great way to start earning more than minimum wage in whichever city/country I happen to be in. Then in August/September the idea is that Edd and I will up and leave New Zealand to move to Paris for a year. I will work in English teaching and anything else possible (having just done an art history major I would love to do some work in an art gallery) and Edd will hopefully get some work in software/testing as that is what he has been doing so far this year. Why France you ask? (Probably not as I am sure France is pretty self-explanatory). I did French in high school/uni and love everything about France and Paris and Edd feels pretty much the same way. Moving away from NZ has its downsides namely leaving our family which we are very close to and leaving Callie! Our lovely baby (Cat) will be relocated to one of our Family’s houses where she will be looked after and hopefully settle in. Leaving Callie feels a little bit like abandoning my child (a total exaggeration I’m sure but not having kids she’s the closest I’ve got haha – cue uncontrollable feelings of guilt haha). If I could easily bring her with me I would. Although leaving our family will be weird and terrifying for me at least, it is also part of why this is a good idea. Being reliant on family is something I need to work on and by moving overseas with Edd I think I can grow and mature in a way I haven’t been able to yet. So after a year in France we will come on back to NZ and I will probably apply for the psych program again hopefully with more life experience and a renewed ability to throw myself in to the program. So there are my next three years penciled out. Is France set in stone? Nope but it’s our main goal at the moment and to be honest sounds close to perfection. Coffees, walks through Paris in the rain, tiny apartments, boulangeries, endless varieties of cheese at local markets, Europe at our doorstep, weekends filled with art galleries and museums… It won’t be easy but it will be an amazing experience for us both. I guess I should also mention a couple of other things that are fast approaching. First off in a couple of weeks (4th December all going well) I will be having nose surgery No, not to make my nose beautiful and shapely but to reshape the interior and bust up my misbehaving sinuses, all which should help with my chronic sinusitis and other related health issues. I am a little terrified after being warned of the various risks but excited to get this done. Then after January and the CELTA course Edd and I have our wee wedding in Feb (17th) so that will be a pretty exciting moment in both of our lives! Needless to say I have mountains of wedding planning to work on whilst stuck home in bed for couple of weeks after surgery. Well, that was a mouthful. There is my life laid out for ya’ll to see. I’m nervous, I’m excited, I’m … well I’m still a little removed from it all to be honest. It doesn’t quite feel real at the moment haha. For Edd and I the key is to remain flexible and yet hard working so we can keep saving the money that will allow us to go to France if we decide to. 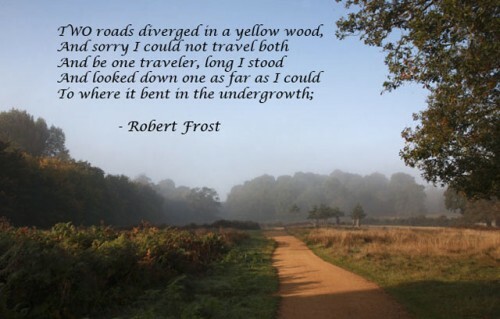 This is an excerpt from one of my favorite poems by Robert Frost (The Road Not Taken) which seemed rather appropriate now faced with the future. The importance of the choices we make and yet the inability to see the true effects each choice will have on our future rings clear as Edd and I try to make our way through the future. I only pray for the wisdom and strength to choose my paths in life and gain from them the most that I can, with my partner alongside.